We present concise and lucid information about Tata car india in these pages. Madrasi is your Chennai city guide. From automobiles to education, from latest cars to travel destinations, you will find it all here. Buy your dream car using the carefully collated information here - Get the lowdown on prices, engine performance and other features in this exhaustive automobile and bike section. The car population in India is rising. According to the Government of India data website, India has 167 cars for every 1000 people in the year 2015. You will find complete details such as - features, technical specifications, safety features and price here for all the cars available in India. We have no bias against any manufacturer or car when we compiled these pages. Buying a car is a major investment. That is the reason we went to great lengths to prepare these information laden pages. Tata Motors is India's leading Multinational automobile manufacturing company with an annual turn over of around US $ 38 billion, belonging to the Tata group. Tata Motors is the world's 5th largest truck manufacturer and 4th largest bus manufacturer. It also owns British marquees - Jaguar and Land Rover apart from manufacturing in India - Tata Nano - the world's cheapest car. Tata is a pioneer in India - first true Indian SUV - Tata Safari, indigenous LCV - Tata Ace and many People Movers - Tata Indica. They have over 8 million vehicles on the Indian road - a testament to the Tata group's wide reach in India. Whether you are sipping a tea or wearing a watch or traveling around in a Safari , you might be using a Tata product. No - we are not biased when we say this. It is a reflection of the reach in our daily life of one Indian company - Tata. 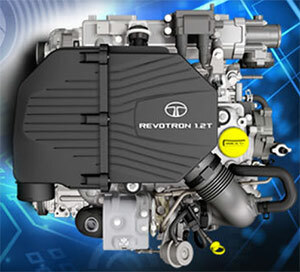 Revotron is a portmanteau of 'Revolution' and 'Tronel' - Balance in French - indicating that Tata offers a revolutionary engine with balance. For starters, Revotron is a turbo charged petrol engine with a switch that can change the ECU mapping to suit - Economy mode, Sports mode or City mode as you wish. Tata uses some world class leading players for this gasoline engine too - Honeywell Turbo chargers, inputs from the Austrian AVL, Bosch and Tenergy. This 1.2 L turbo charged MPFI petrol engine belts out 140 Nm of torque at a surprisingly low 1750 rpm. The output is about 90 BHP and Tata claims phenomenal fuel efficiency and a 'highly drivable' engine in today's bumper to bumper city driving conditions or out on the highways. This engine might be under the hood of the forthcoming Bolt and Zest.